A dear friend lost her husband to cancer this past year. 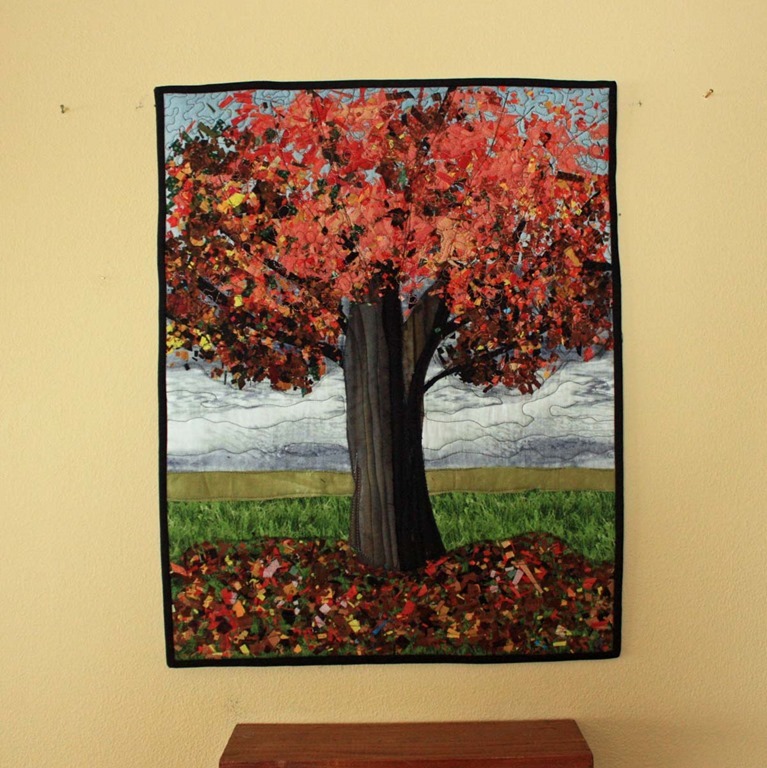 When she approached me to make a memorial art quilt out of his ties for her mother-in-law, I didn’t have to think twice about it, since it had already been on my mind. 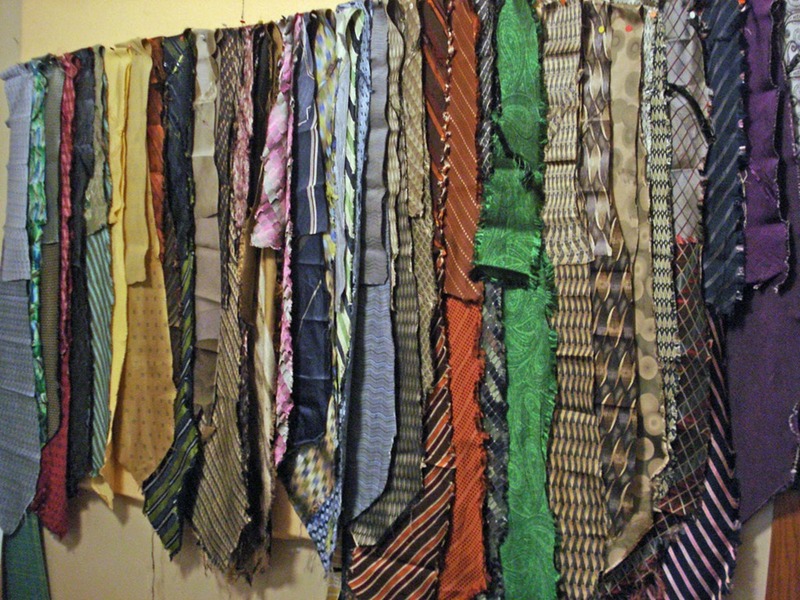 But I’d never worked with ties before as material for an art quilt—could I be successful? How hard is it to take a tie apart? How strong is the material? Should I use a stabilizer? These are all questions I pondered while going through the huge box of ties that she provided. I’d love to share with you what I discovered. First of all, it’s SO EASY to take a tie apart. There’s one strong thread that holds the seam down the back of the tie. Once you locate this thread, make one cut, and give it a good tug from the opposite end, and it’s done! 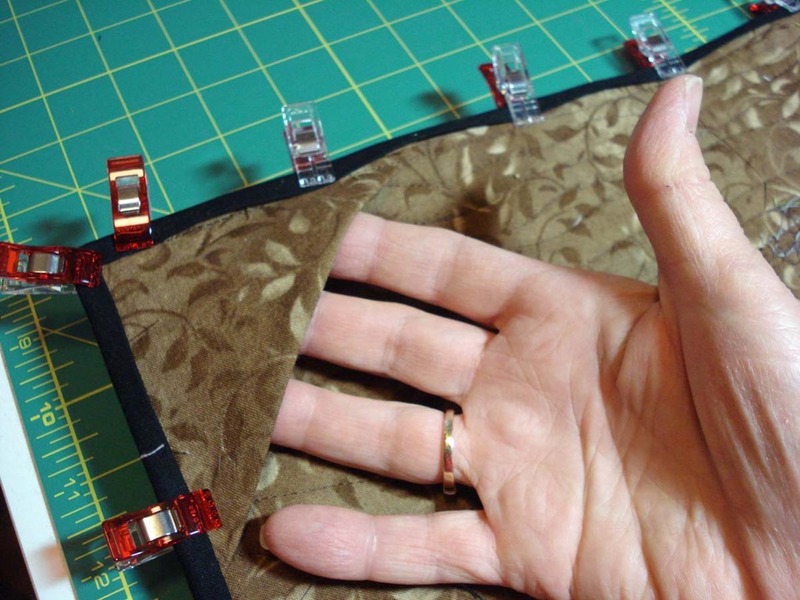 Take out the lining and you’ll still need to deal with both ends. I chose to cut them off, but a little seam ripping would also work. 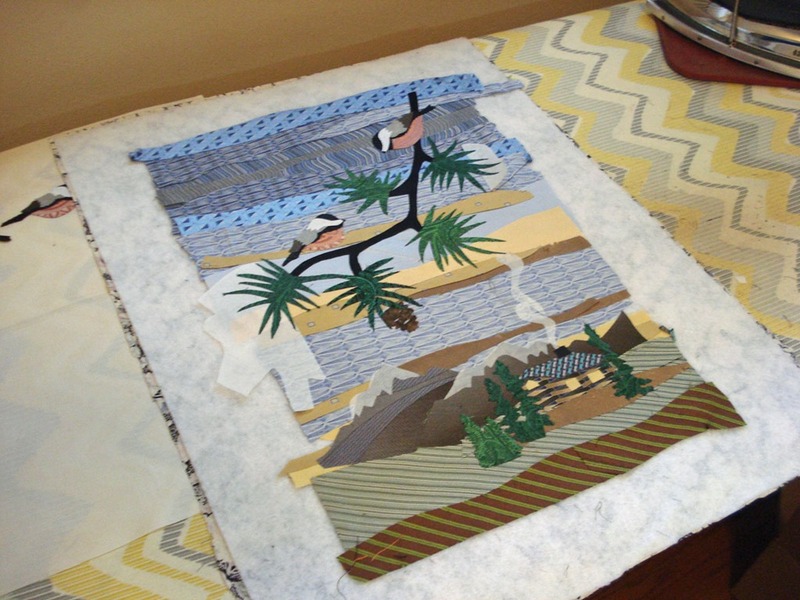 I had an idea in my head about what I wanted to do…a small landscape art quilt based loosely on a pattern I’d used earlier (see post HERE). So my first task was to see what I had to work with. I pulled all the ties that had the colors and textures that might work, and lined them up on my design wall (there were a lot more that didn’t make the cut and were left in the box for later). 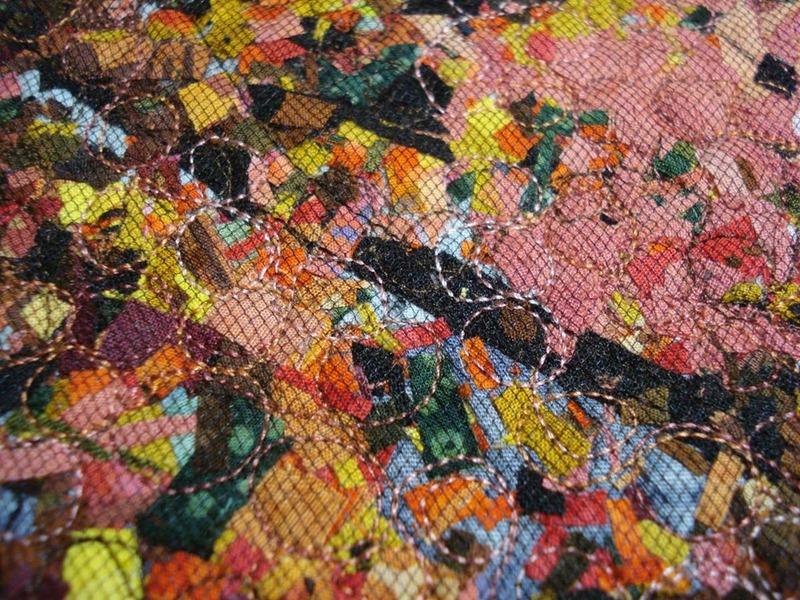 What amazed and surprised me was the texture and beauty of the tie fabric once it was washed, ironed, and ready for use. Some were very light weight and needed stability (I ironed on a light weight fusible woven interfacing to those). Others were a heavier weight and I used them as they were. I also found out that the reverse side is sometimes even more interesting than the “right” side. I used both to get the shading I needed. I knew I needed to wash all the ties—but when: before or after deconstruction? I experimented, putting about a dozen ties in a zippered netted bag (the kind used for dedicates) and tried washing some before and some after deconstruction. Both came out tangled, and both worked, but washing before deconstructing really helped keep the mess and tangles to a minimum and made it much easier to pull apart and iron. Once that was done, and the ties were all deconstructed and ironed, I started pulling out ties for the birds. 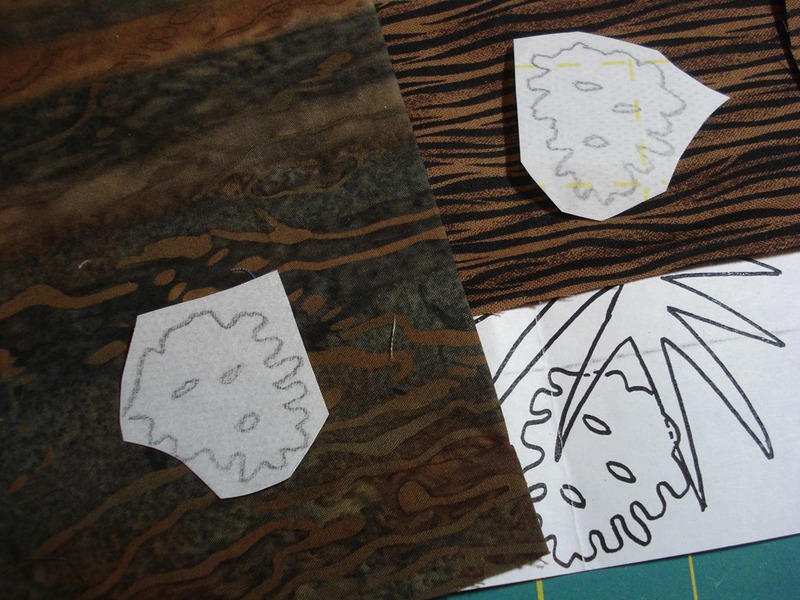 Here I’ve cut the pieces for the bird applique (using Steam-a-seam 2) and will fuse it together. 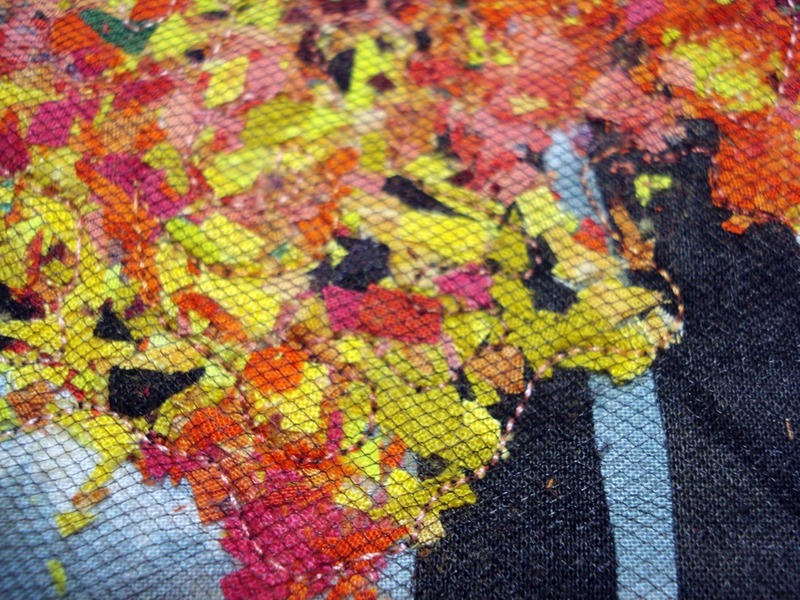 I was surprised by the texture of the beautiful silks used in the ties. I even used the linings for solid black and white on the bird’s head. 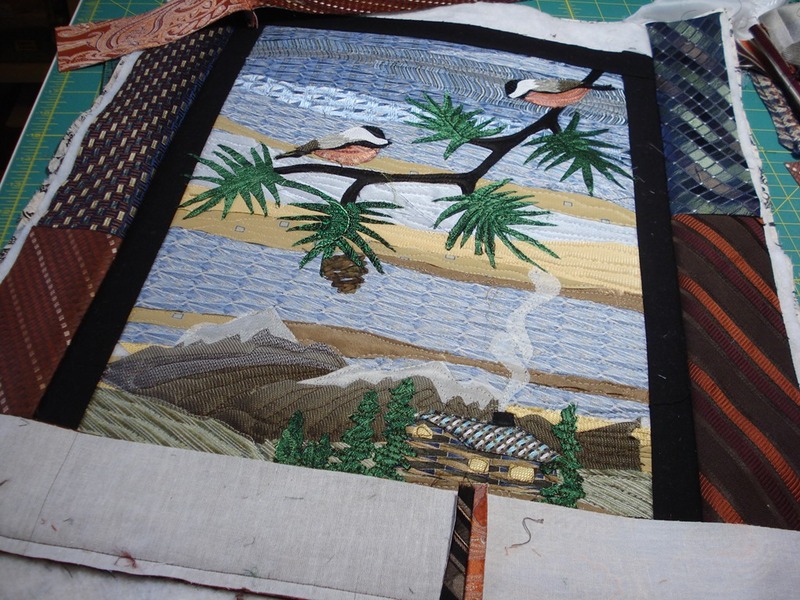 So the entire center of the art quilt was made exclusively with the tie materials. 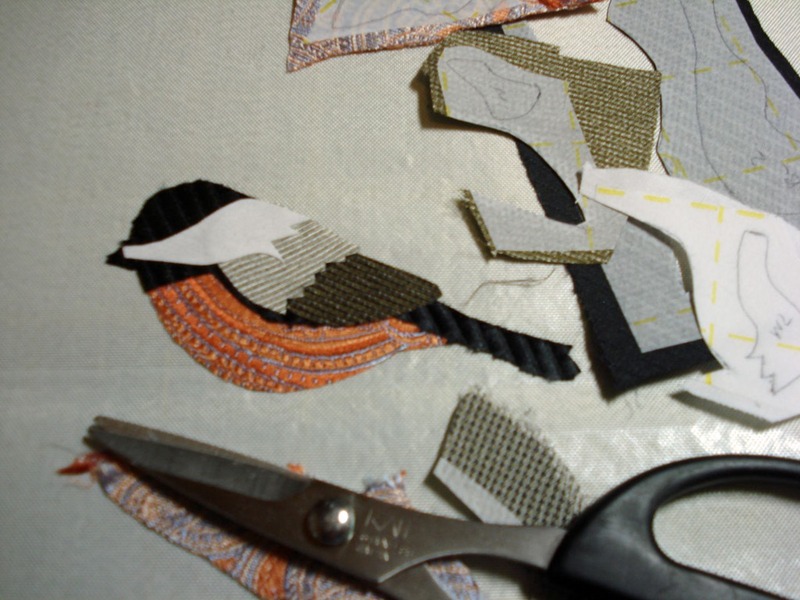 Here you can see the chickadees fused and ready to be placed on the background. 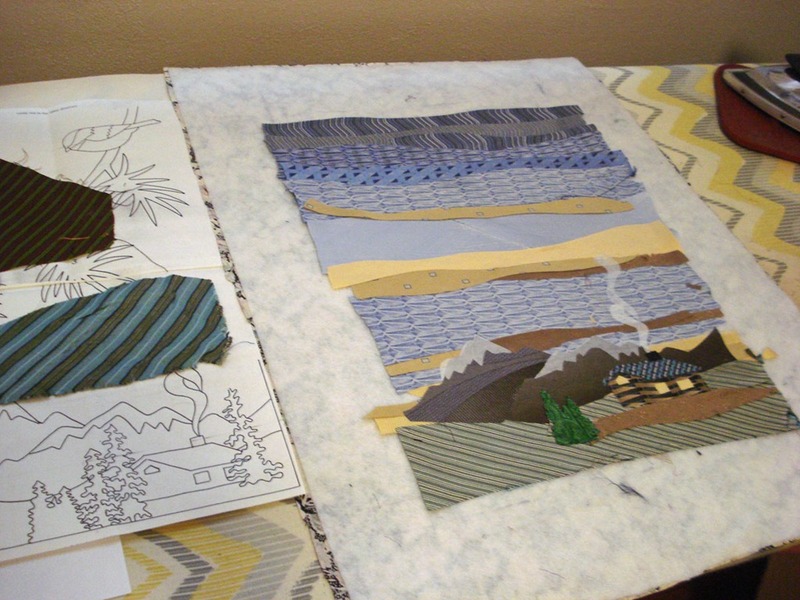 I’m starting to choose the ties by color and texture that will work for the sky, mountains, and foreground. There were some limitations in the color selection, so I got creative and used both sides of the ties and added yellows and gold. Most of the tie material is not backed with interfacing, or Steam-a-Seam 2—they’re simply laid onto a fusible pellon fleece batting with the fusible side facing up. However, the log cabin was prefused together the same way as the chickadees. 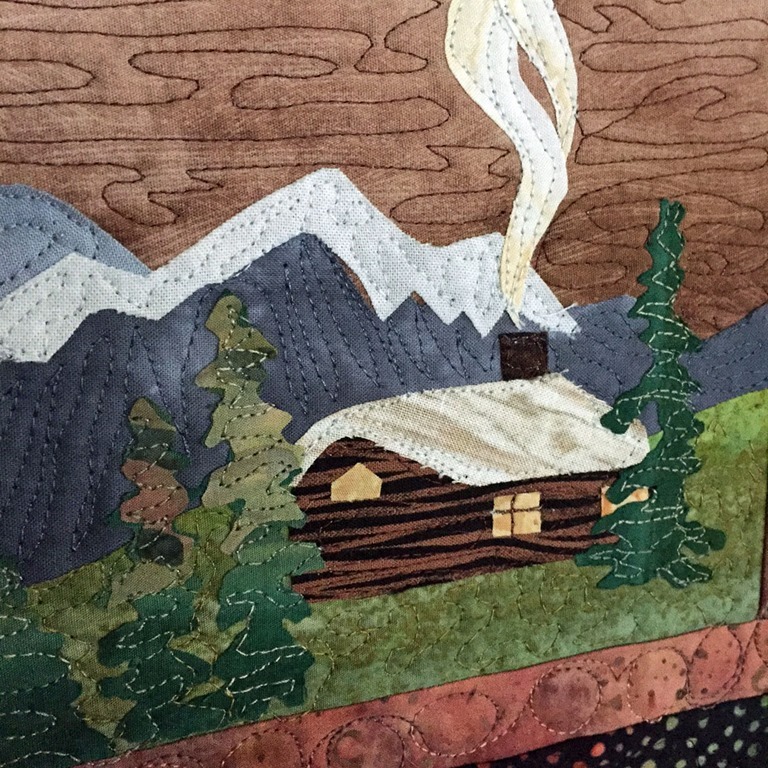 Notice the smoke coming up from the chimney of the log cabin—it’s that tie interfacing. It was shear and luminescent and made the perfect smoke. Here (below) it’s starting to take shape. I tried to get contrast between the sky, mountains, and foreground scenery. 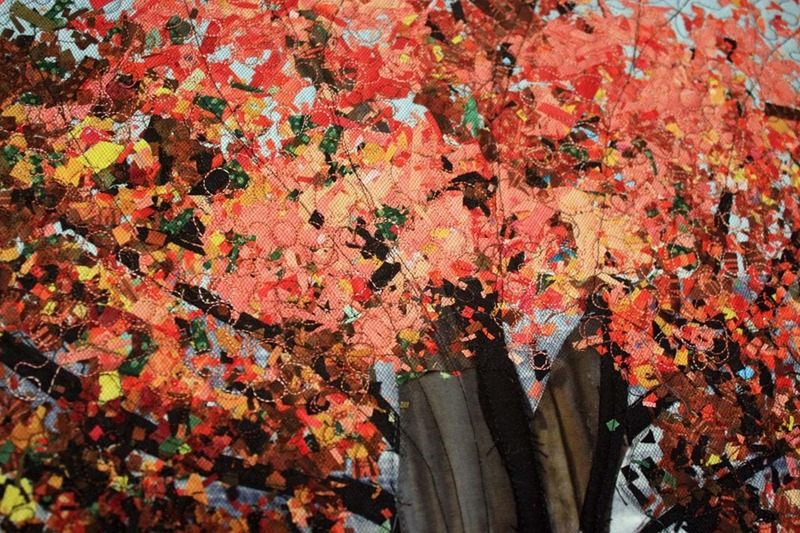 When the branches, leaves, and pre-fused chickadees were added, it really started to look complete. Notice I placed a piece of parchment paper under the leaf in the lower left hand corner so it wouldn’t fuse down and I could choose to fuse it on top of the border after the border was added. The backing and batting are about 3-4 inches larger on all sizes to make it easier to add a border if I chose to. I thought it did need a border, so I added a narrow inner border using black cotton fabric (the only part of the quilt that wasn’t tie material), and pieced a border of tie material for the outer border. 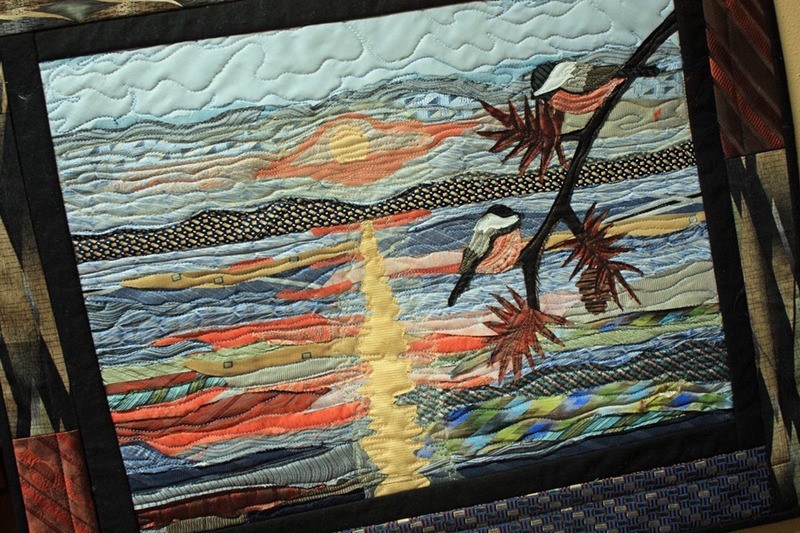 Then I quilted everything using several colors of veriagated cotton threads. I used a bit of gold thread on the sky for sparkle. After I finished, I really felt my friend needed a remembrance art quilt she could keep too, so I created a second art quilt just for her… actually, she can choose which one to keep and which one to give. It’s based on the same idea, with the same Chickadees, but has a pieced background over Lake Mendota with the sun. 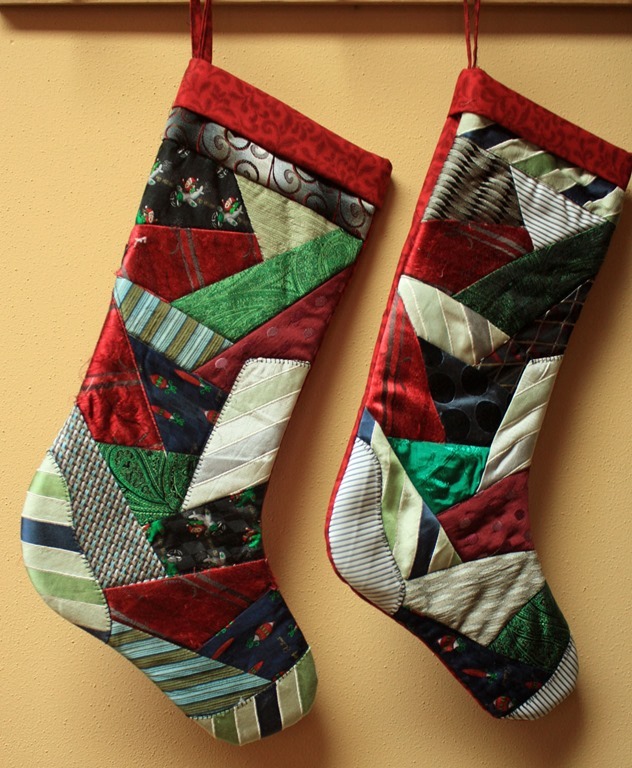 And couldn’t forget her two wonderful children… I thought they might like a Christmas stocking to remember their dad each year. I couldn’t find enough “Christmas-like” ties to choose from so I used a red cotton fabric for the cuffs, backing, and lining and did a crazy-quilt patch design on the front, using tie material backed with fusible stabilizer. I really enjoyed working with ties. It was a new experience, and I may get out the box of my father’s ties that I’ve been saving to do something similar. Whether you have saved a loved ones ties, or decide to go to a thrift store, I encourage you to give it a try. I found the tie material is so beautiful, the silks give your project a wonderful sheen, and there are so many patterns, textures, and colors to choose from. Why not give it a try? I’ve been wanting to create a second art quilt using a pattern by McKenna Ryan as the inspiration. 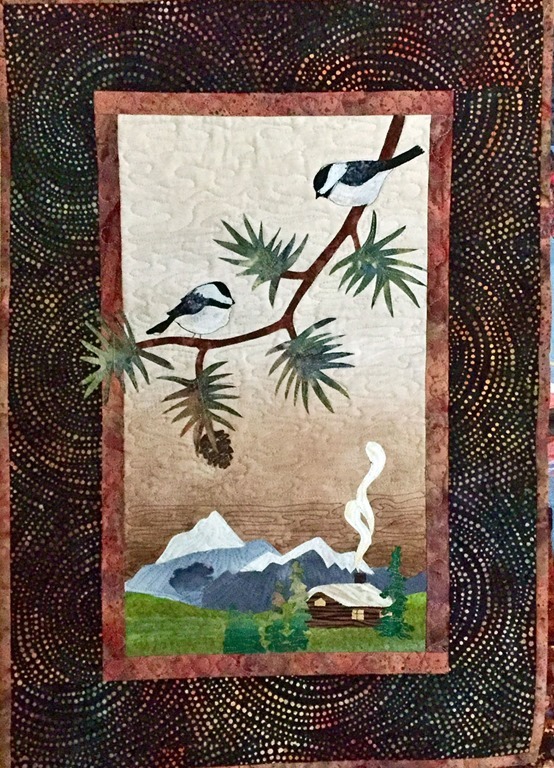 It’s a peaceful mountain scene featuring a branch in the foreground with Chickadees. 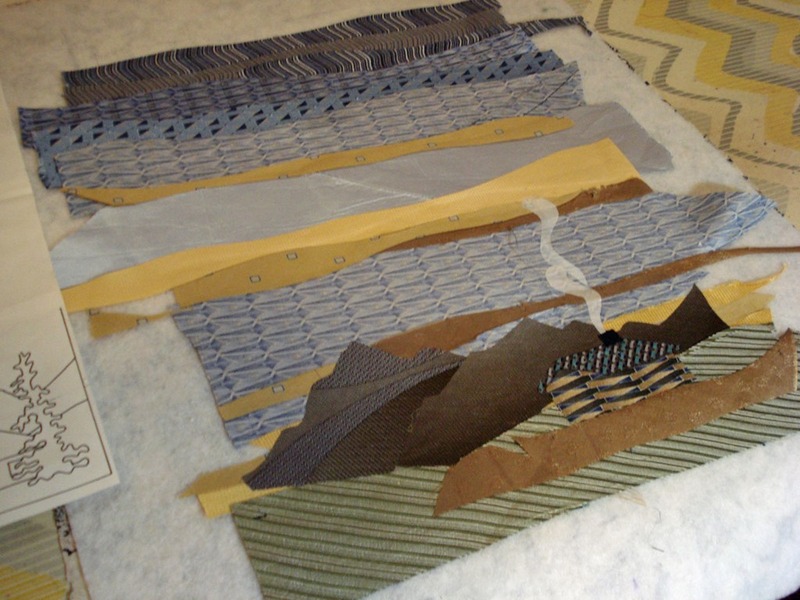 The challenge for me was to try to find just the right fabrics for each portion of the scene by auditioning them one by one. I wanted choose the best fabric to give the contrast needed in the composition. 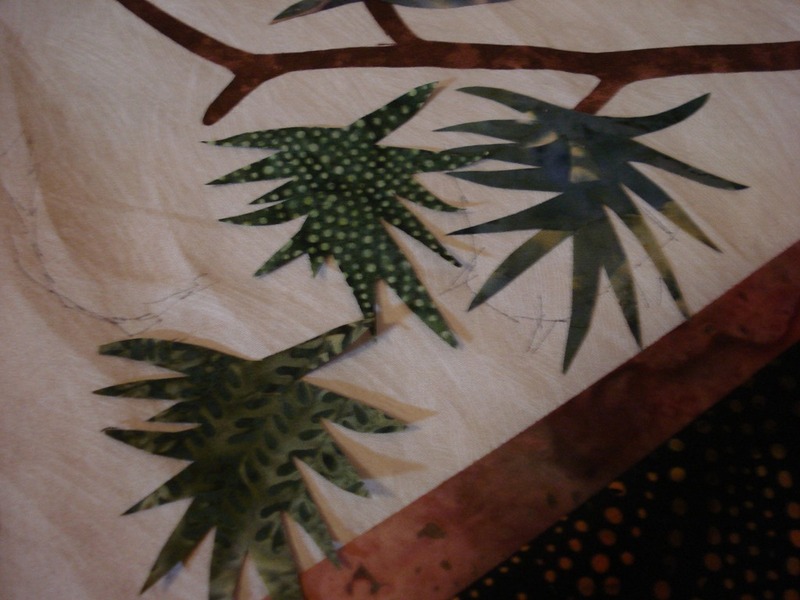 I started by creating the background, including the borders (so that the branch could be appliqued to extend into the borders. 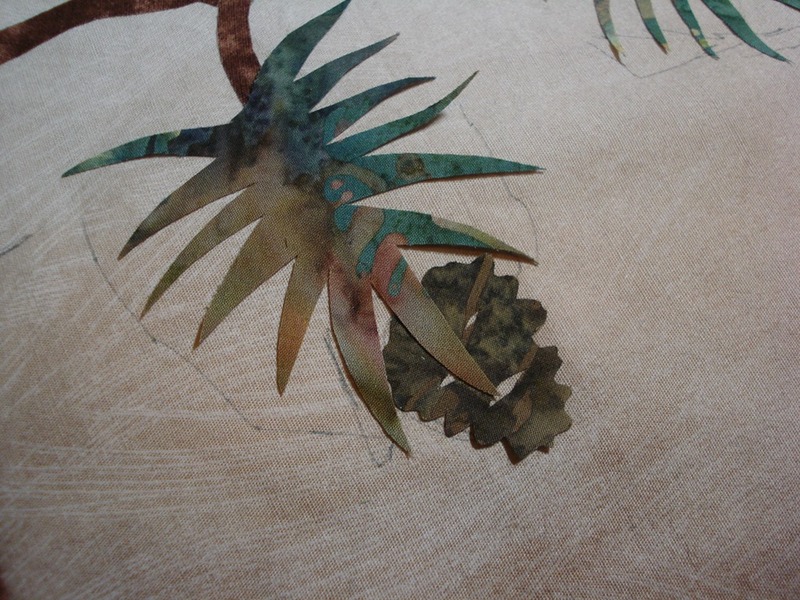 Then I draw each part of the landscape onto a sheet of Seam-a-Steam 2 Lite. (I’m so glad this product is back on the market again.) 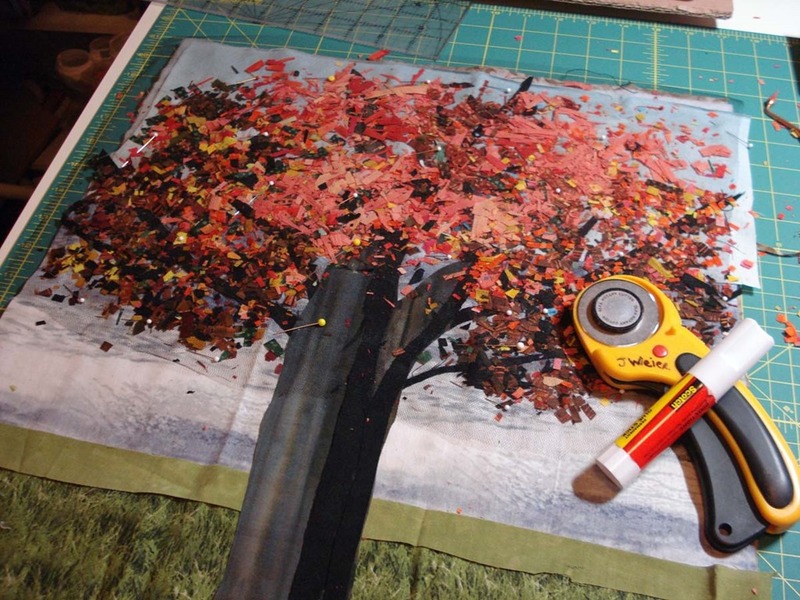 I love it because it a double-faced fusible that has paper on both sides. You peel one side off, and it’s “sticky” so it clings to the fabric you want to use, but it repositionable. 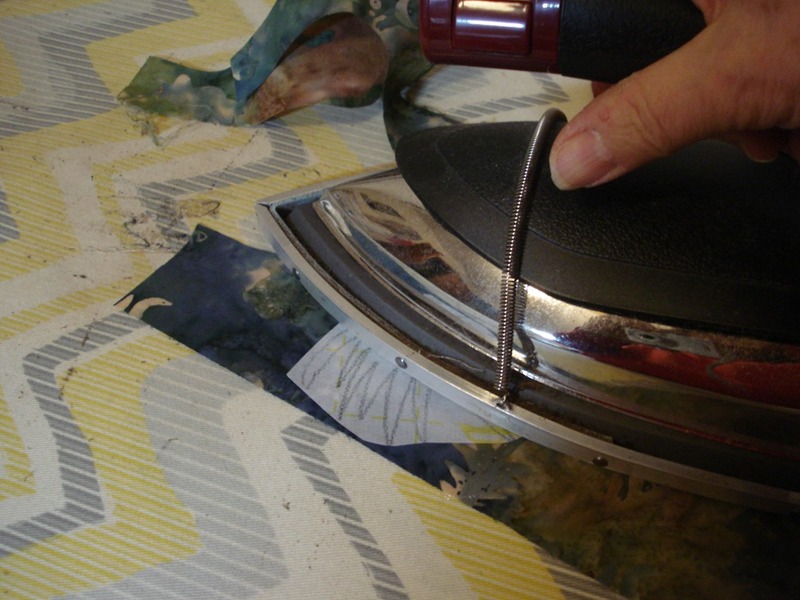 Then you fuse it with the iron, and wait for it to cool down before cutting and peeling off the second paper to fuse it to the background. I started with the background and then cut and fused the individual items to it, starting with those furthest back and ending with those closest to the foreground. 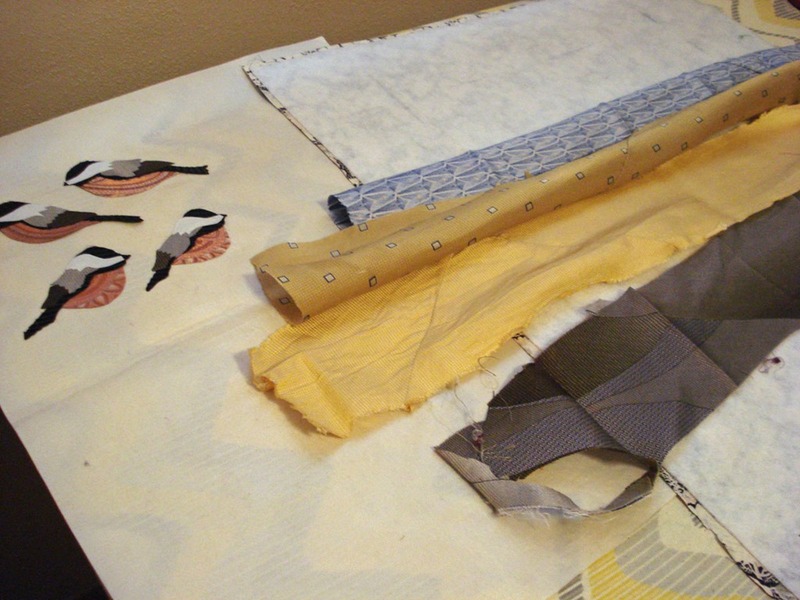 I “auditioned” several fabrics before deciding on which ones to use, and which ones didn’t work. The log cabin and trees were fun to pull together. 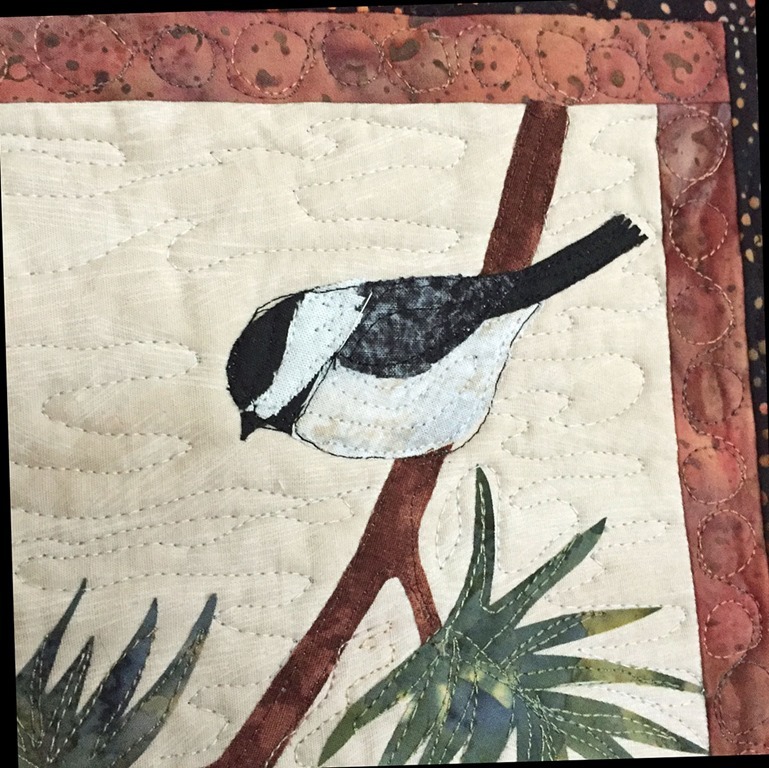 For the chickadees, I created each bird separately and fused the pieced together as one and then set and fused them to the branches. 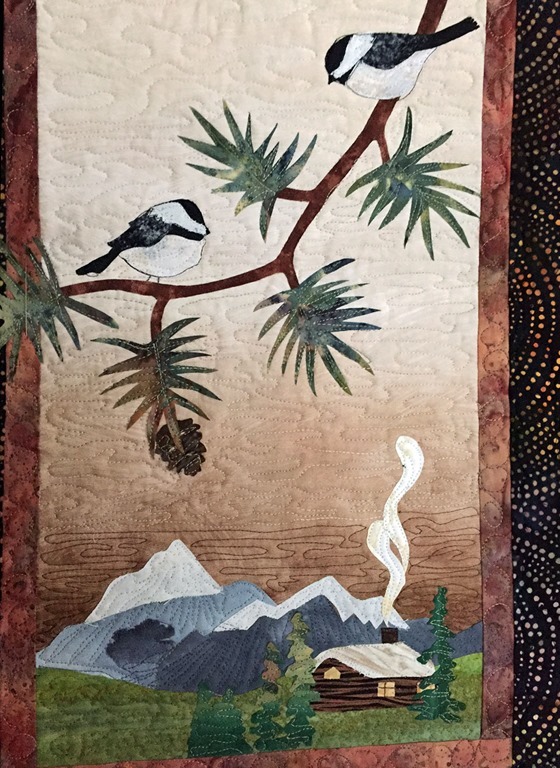 Here’s the chickadee & log cabin after they’ve been quilted with a bit of thread painting. After everything was fused down, I quilted and thread painted with different colors of thread. My favorite thread is Aurifil. They have so many luscious colors to choose from. Here’s the result after quilting and binding. 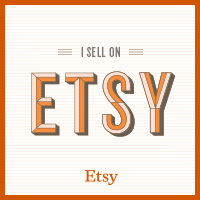 I immediately put it for sale in my Etsy shop, and it’s been sold and is on it’s way to it’s new home in Toronto, Ontario. 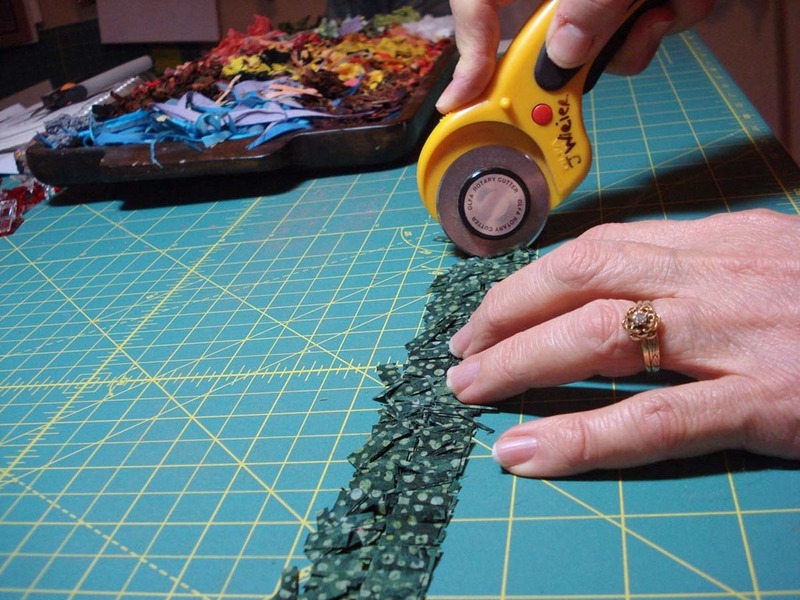 It’s January, and time to begin Project Quilting! As you’ll remember from last year, this challenge is put on by Kim Lacapik of Persimon Dreams blog. Just like “Project Runway”, Project Quilting has a challenge, a time restriction, and instead of voting someone off, the viewer votes who wins! I’ve been wanting to participate again this year, because it helps the after-holiday, mid-winter blues, and jump starts creativity. This week’s challenge (#1) is “CONFETTI”. Right up my alley. 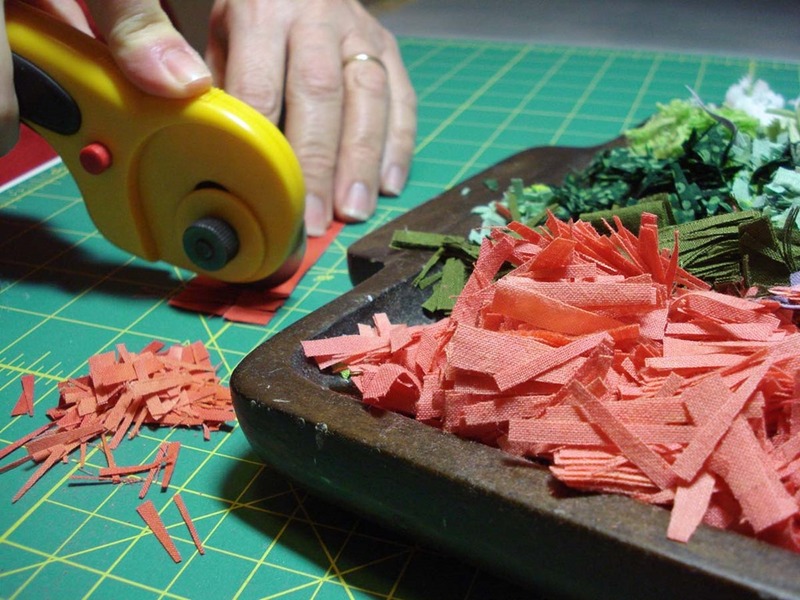 I immediately thought of the “confetti technique” I first saw demonstrated by Noriko Endo. 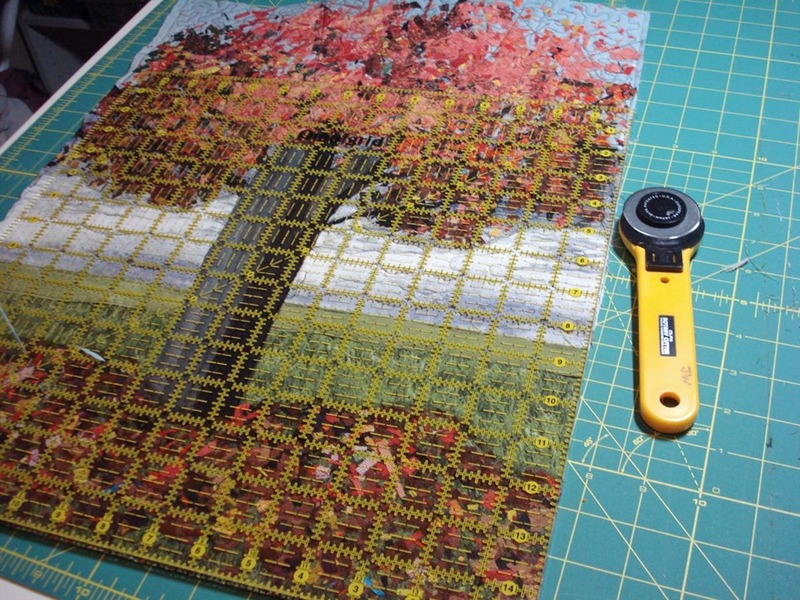 I’ve used this technique for many of my art quilts in the past, and was wanting to begin a new one. This challenge is just what I need to get me going. First I need inspiration…so I took some time to look through my photographs to find something that inspires me. I think I’ll choose a single tree. One that is the very first to show it’s color and even start dropping some leaves before the others have turned—and the grass is still green. Next is the background. 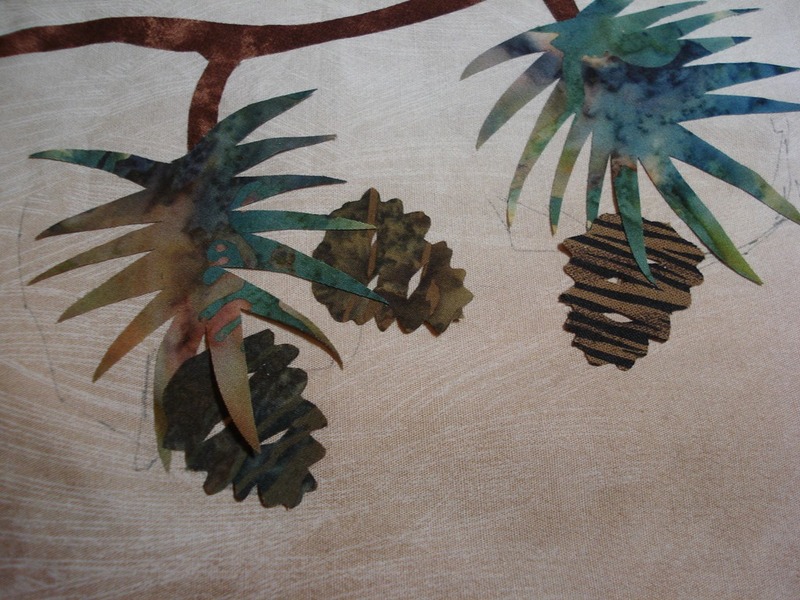 I’ve chosen some hand dyed fabrics for the sky & commercial batiks for the background & foreground. 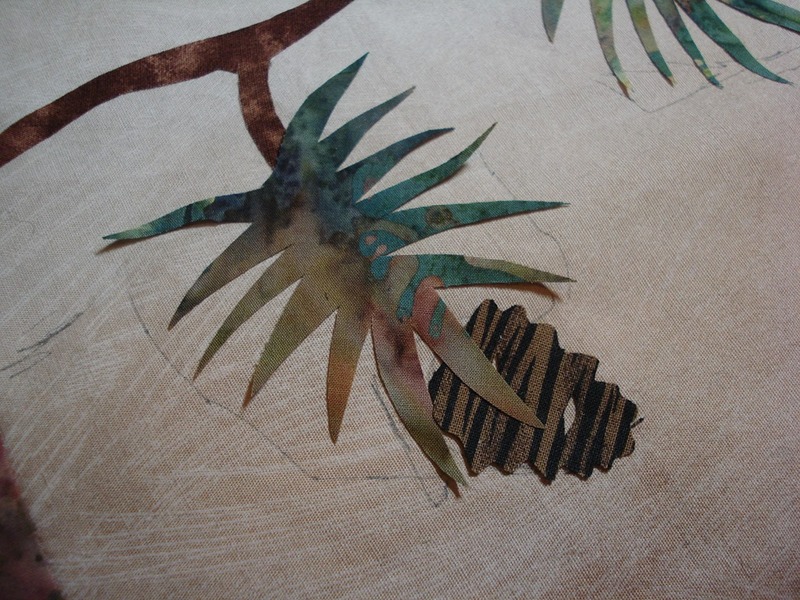 I cut and temporarily “paste” strips of grey & black fabric onto the background for the tree trunk & branches. 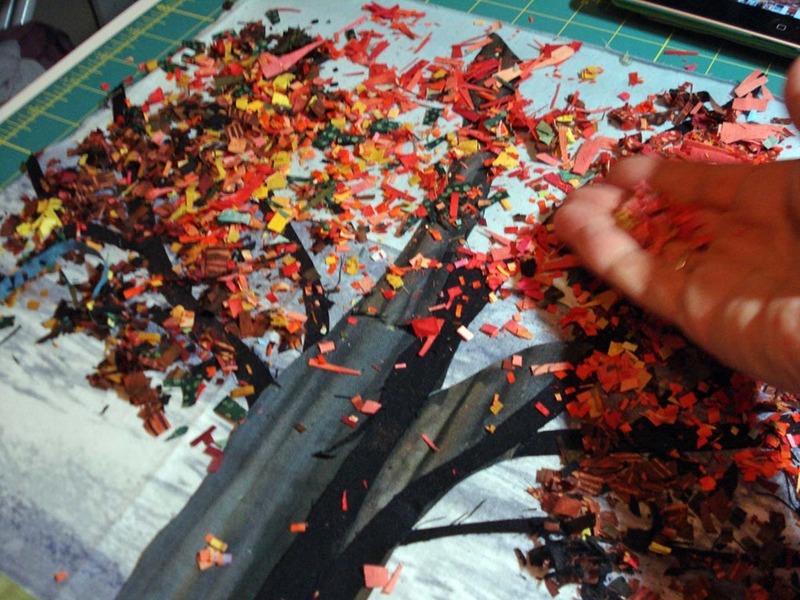 Then “sprinkle” and position the confetti leaves. Everything gets encased in black tulle & pinned before it’s taken to my sewing machine. First I straight stitch around the edges so nothing “falls out”, using dark grey cotton thread and my walking foot. 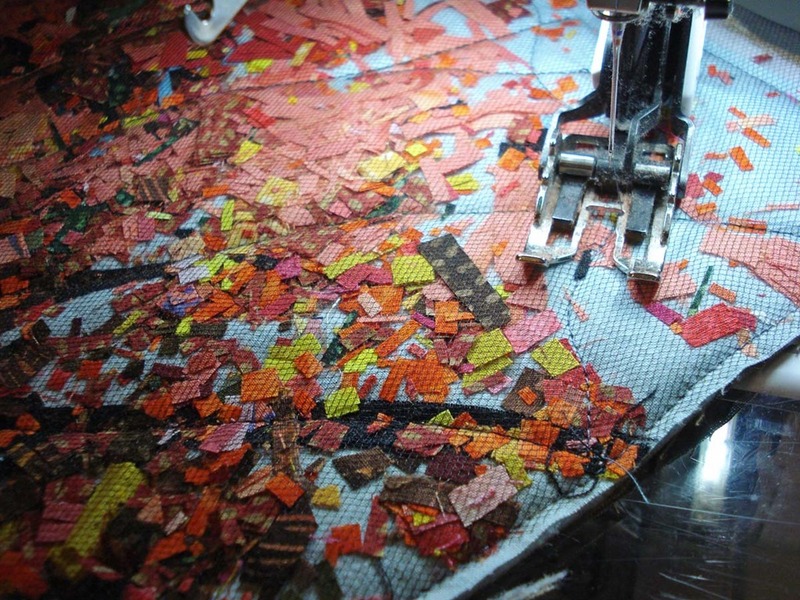 After that, I put on the free-motion foot, drop the feed dogs, and sew over the confetti & tulle with different colors of variegated thread. I liked the look of circles. 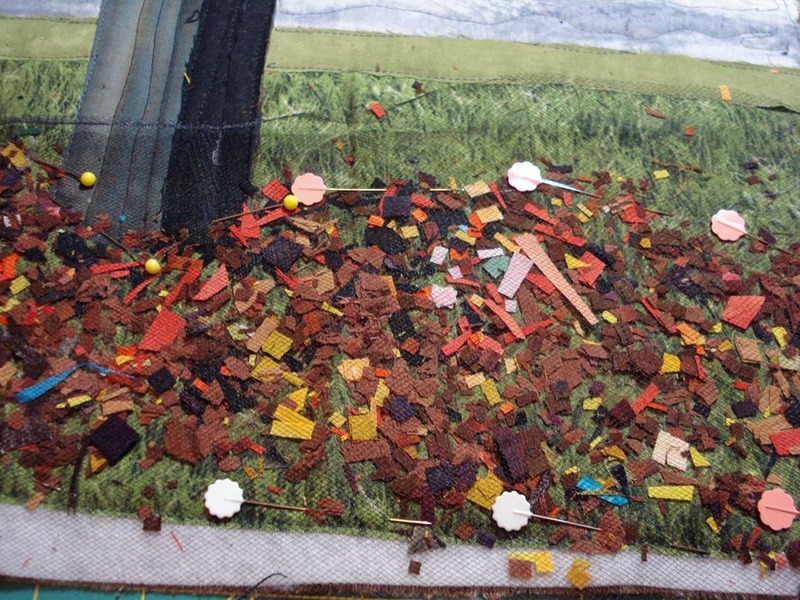 Now I can move on to the bottom half and add the confetti for the leaves that have fallen to the ground. Everything needs pinning so the confetti doesn’t fall out before I get to the machine! It always looks better once it’s all straightened and trimmed. 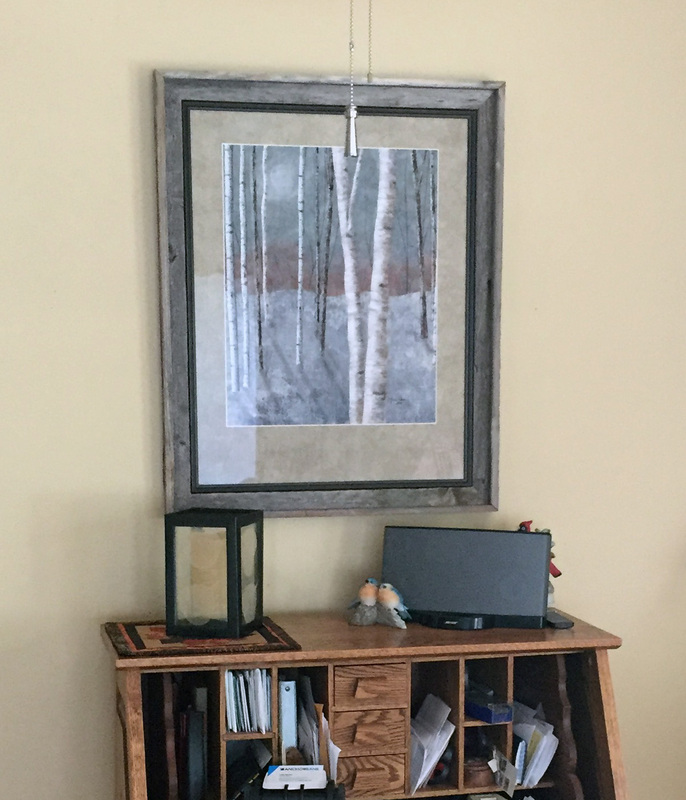 I like to add triangles to the corners so the piece can be hung by wooden dowels. 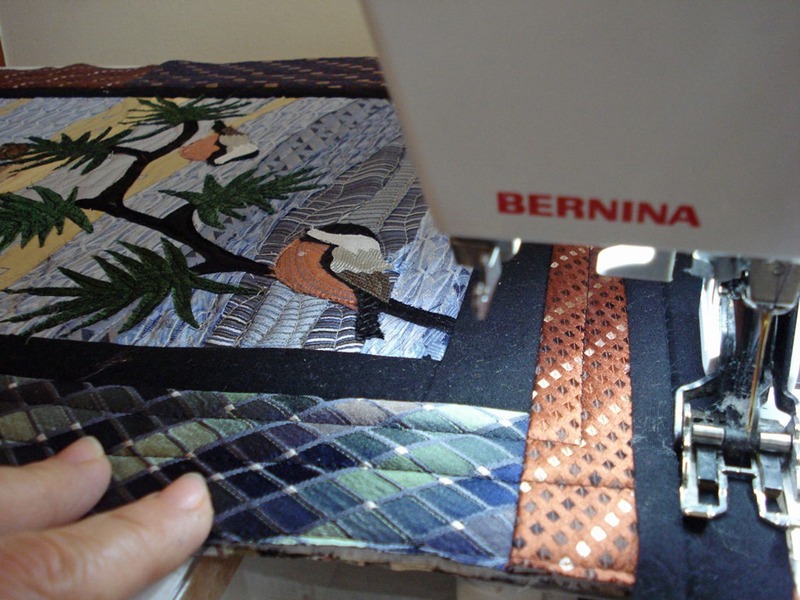 So here you can see the triangles and binding ready to sew by hand. 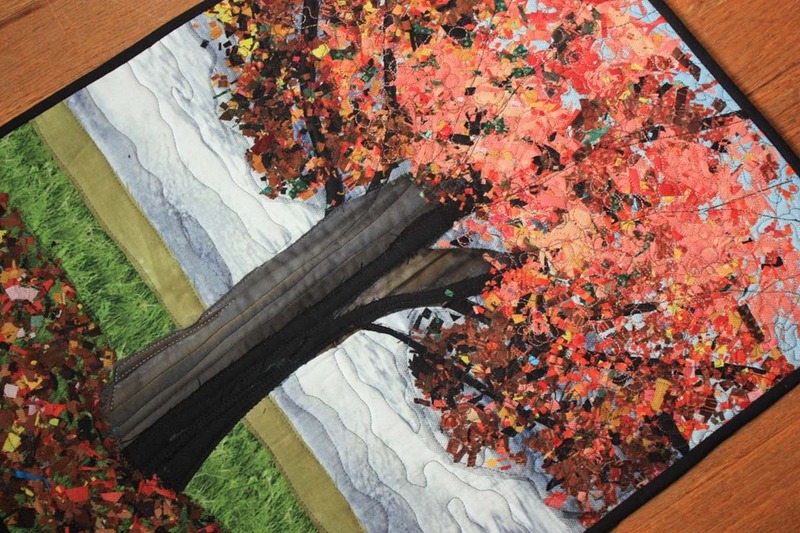 I hope you’ll go to Persimon’s Dream blog and vote for your favorite “confetti” quilt. The voting starts soon…January 10, 2016!! UPDATE: The voting has closed, & my art quilt came in #2 (SECOND!!) 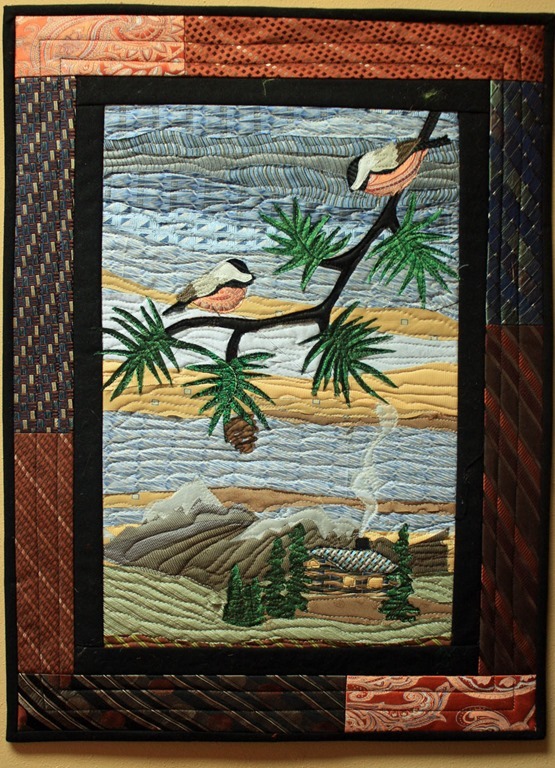 out of the 67 beautiful quilts entered! I’m so pleased!! If yours was one of my votes, I want to say thank you so much for your vote! 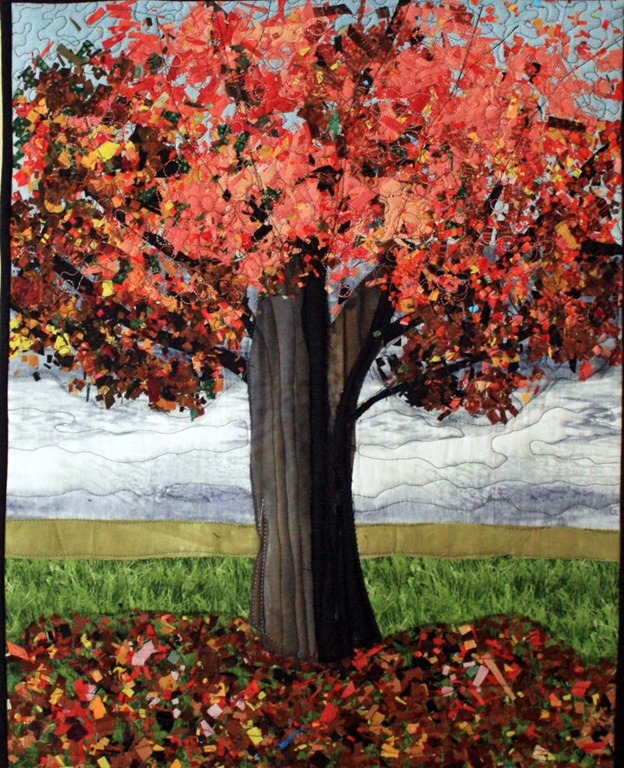 Hope you enjoyed my journey through making the quilted wall hanging this week to enter in PROJECT QUILTING: SEASON 7 (2016)!! It was fun. 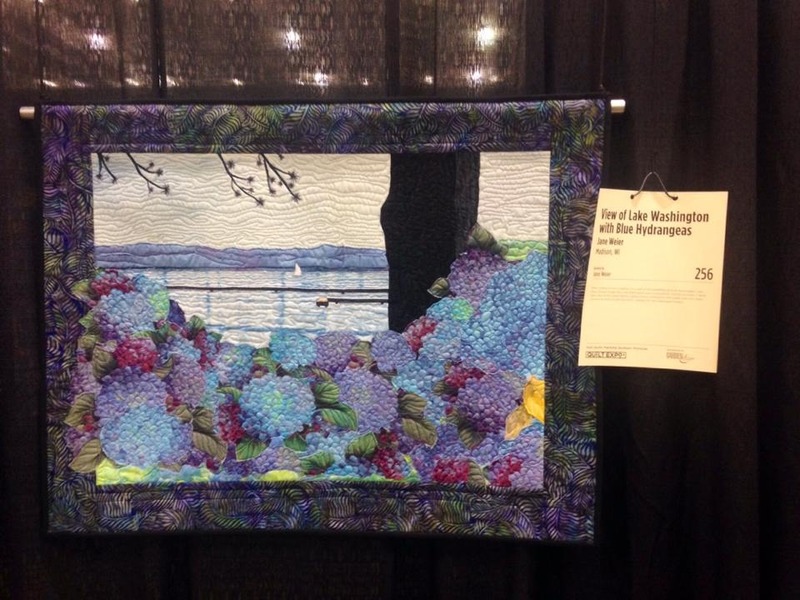 I love attending the Quilt Expo held in Madison during September each year. I’m so lucky–I only live a few miles away! 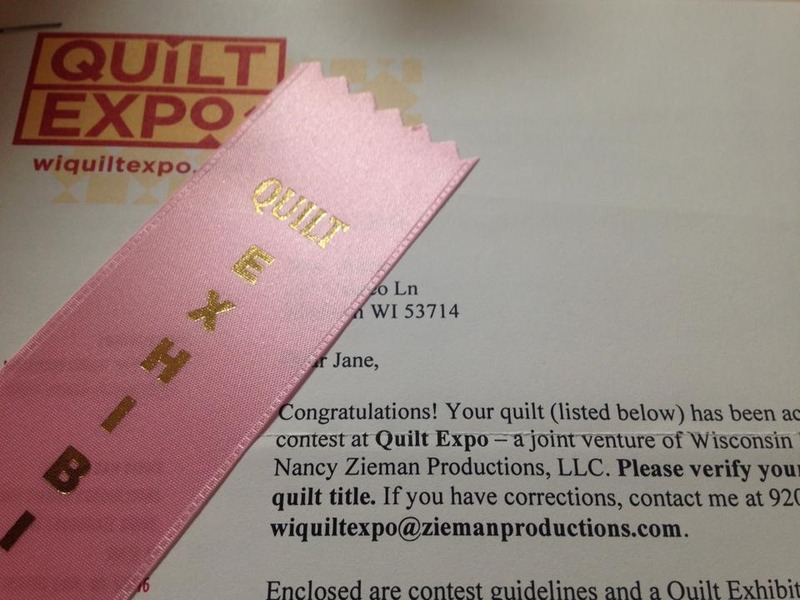 It’s sponsored by Wisconsin Pubic Television and Nancy Zieman, and has a wonderful quilt show, workshops, one-hour lectures, vendors, and much more. I found 3 days last year a bit overwhelming, so I decided to concentrate on two days this year. One day was filled with shopping, taking in the quilt show, and a few one-hour lectures. 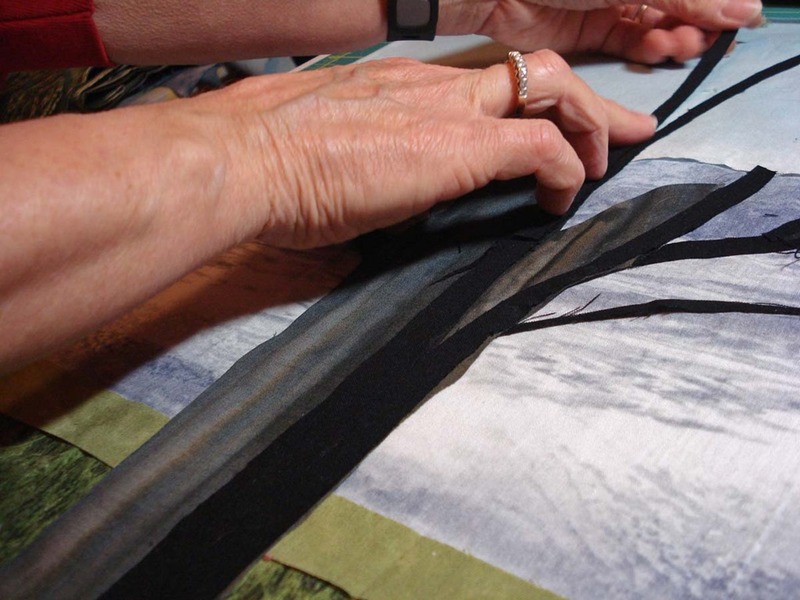 The second day (Saturday) I decided to take an all day class by Susan Hoffmann entitled “Landscape Painting with Fabric”. Here’s a photo of Susan at the start of the workshop. We had about 20 or so students in the class. Susan was so patient and easy to understand. She told us not to be intimidated by the class and assured us that everyone in the class would go home with something they loved. She was right, as you’ll soon see. 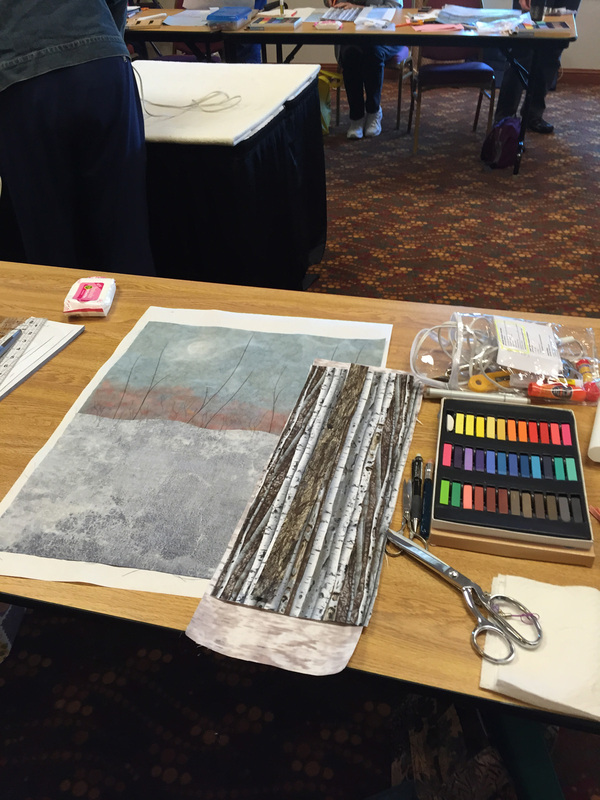 We were each given some batik fabrics, fabrics for trees, heat-n Bond Lite to create our landscape, and a Copic marker, blender, and soft pastel chalk to use during class. The other items we brought with us. Here’s the start to my landscape. Susan gave us great step-by-step instructions on how to piece and fuse the background, and the techniques used to draw on the fabrics with the pastel chalks. We added shrubbery above the sky line, and tree trunks and branches onto the background with the Copic marker. We even drew in a faint outline of a full moon in the sky. 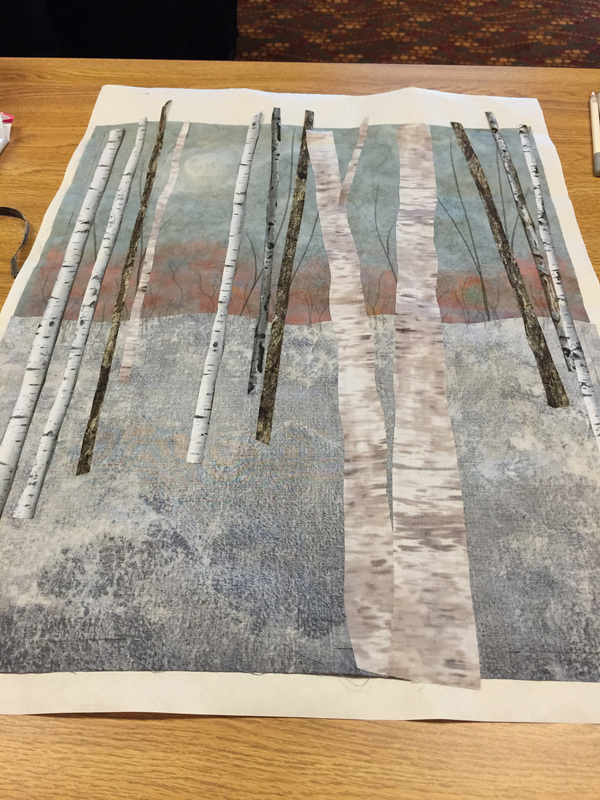 The next few photos show the progression of the project … In this one, I’ve cut and placed fabrics to resemble birch and other trees. The trees are fused down using Heat’n Bond Lite. You can see it’s beginning to look like a landscape, but it’s rather flat. 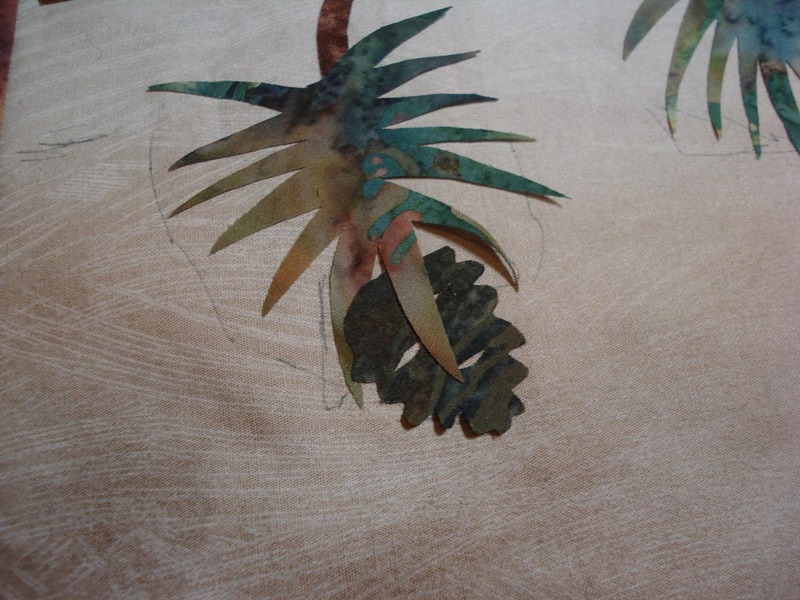 Now the fun really beings–we started shading the tree trunks with a darker charcoal grey on the right, and a light pencil on the left of each trunk. I chose to incorporate some oranges and browns into the background. Finally, we added shading using the full moon as our light source. Can you see the difference in how flat the first photo was with the shading in the final photo? It’s really remarkable. The last step was to have her spray a fixative onto the fabric to set the chalk. Every one of the students had something completely different, yet they were ALL beautiful! 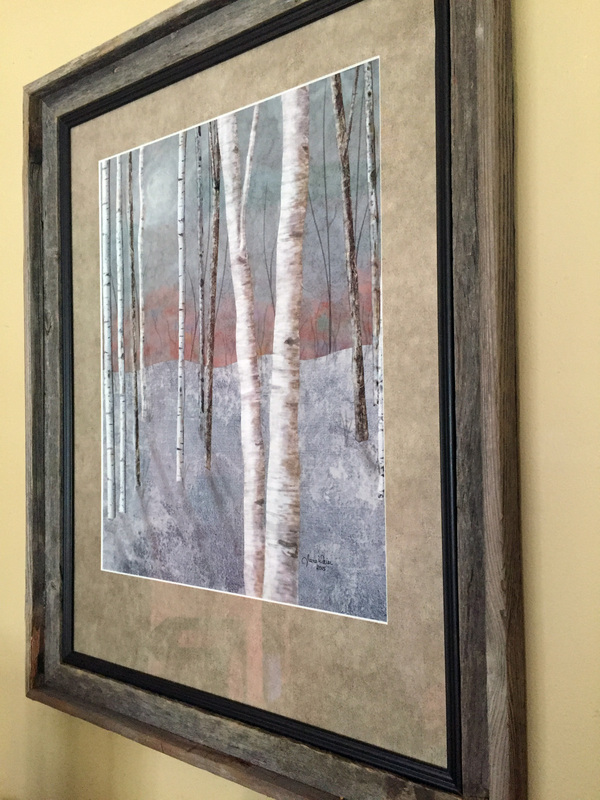 After I got home, my husband liked it so much I decided to frame this piece instead of quilting it (I’ve never done that before). I got out my coupons from Hobby Lobby and away I went. It only took a week or so. And because Susan had the foresight to give us a diagram so the final framing would fit into a standard 22 x 28 frame, it wasn’t as expensive as I had imagined. 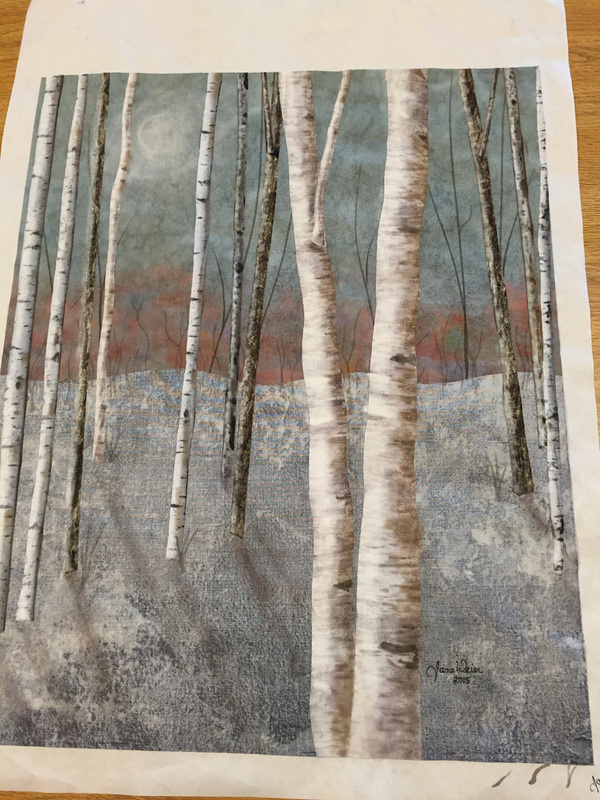 I think their suggestion of the rough wooden frame along with the linen-like texture mat brings out the birch trees, and the additional thin black frame helps to stop your eye. If you ever get the chance to take a class from Susan Hoffmann, I highly recommend it. (See more about her classes at her website here.) Don’t be intimidated, just have fun. It’s a learning experience. I was amazed that I came away with something I like so much. You will too, I’m sure. 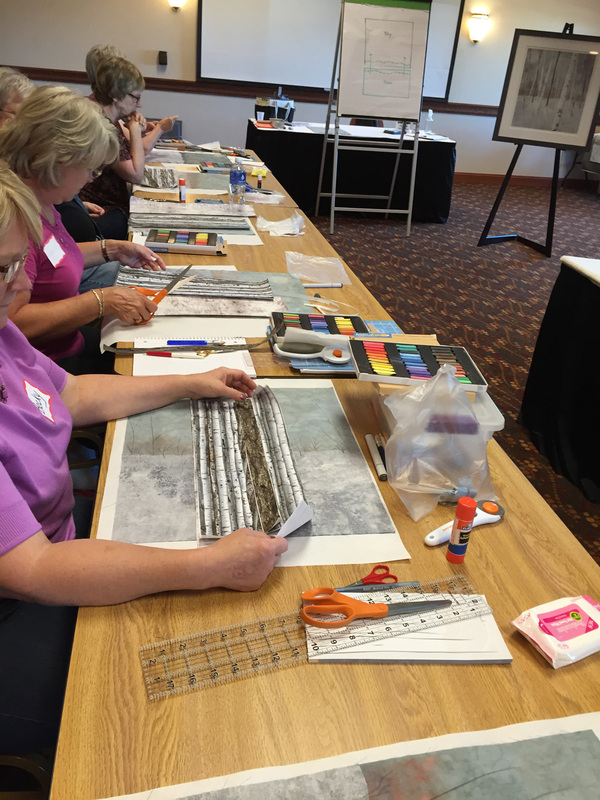 She’ll be doing another full day class at the next Expo–and I’ll be there! Quilts are made up of broken lines, just like life. Over and over again, we try to walk a straight path but run into dead ends, sharp corners, and uneven ground that cuts us off and forces us to change direction. Sometimes it’s painful, other times joyful. But it isn’t until you take a moment to stand still, step off the line, and back away that you finally see the truth. Those unexpected turns and startling about faces, the chaotic path? It wasn’t chaotic at all. When you step back to see where you’ve been, you discover the shape, the reason, the intricately beautiful pattern and vivid colors of a life stitched together from what, at one point, had seemed nothing more than mismatched scraps and broken lines. Stepping back, you see there had been a design all along, and a Designer. and realize and be grateful that there’s been a design, and a Designer all along. 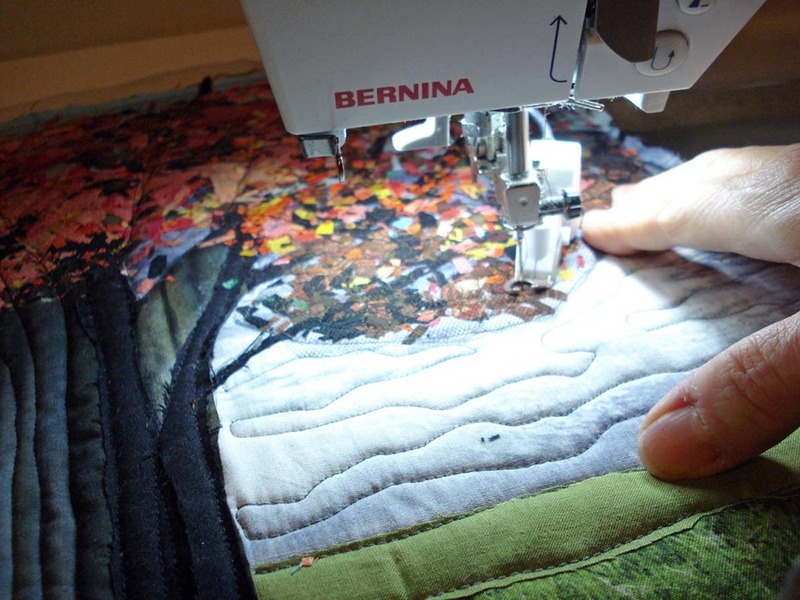 Wishing you all a Happy and Healthy New Year…and HAPPY QUILTING! 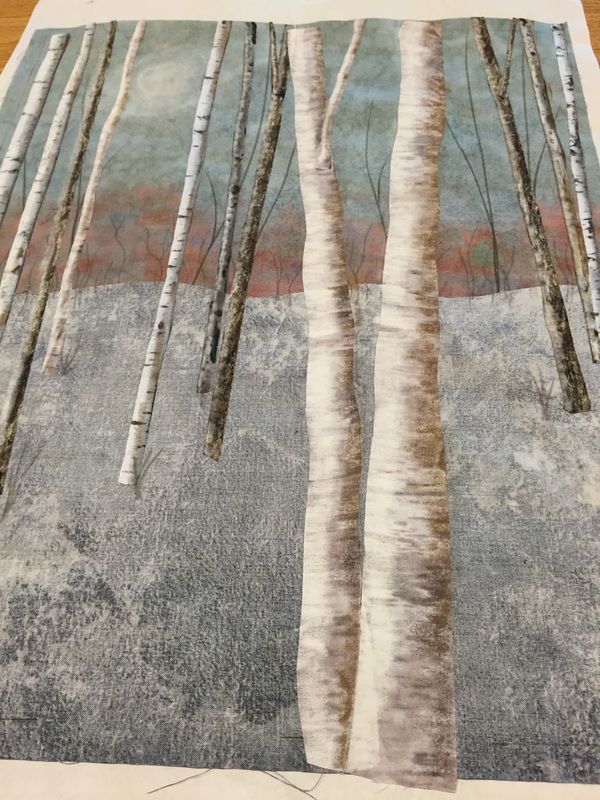 Madison Quilt Expo—3 Day Adventure! 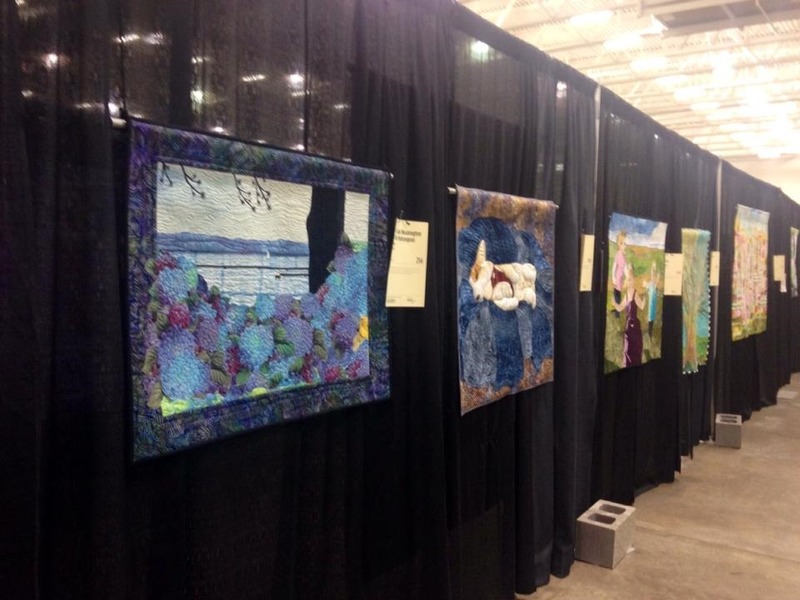 Have you ever been to the Madison Quilt Expo? I go every year. Some years only one day–other years, two days. Sometimes I volunteer, sometimes I just go with a friend to the vendors/quilt show/lectures. But this year, I decided to go all out and go all three days…and (for the first time) I actually had the courage to enter one of my quilts. What an adventure! I was so excited and honored when I got the letter in the mail a few months ago that my Hydrangea art quilt was accepted! I was so happy, just to be in it. 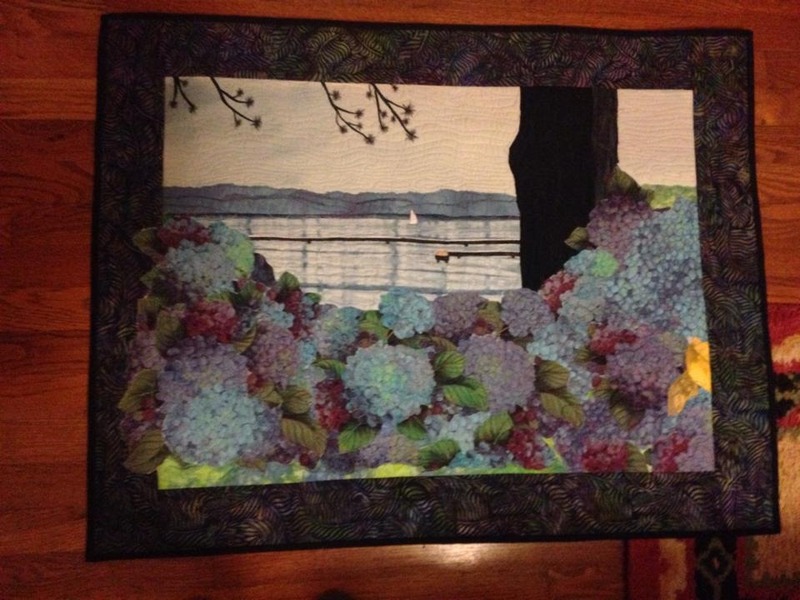 I did a blog awhile back on making this quilt: “Lake Washington with Blue Hydrangeas”. And how I dyed the hydrangea fabric a deeper blue and fussy cut the individual flowers; and (using a shibori dye method) how I made the water fabric with ripples for the lake. 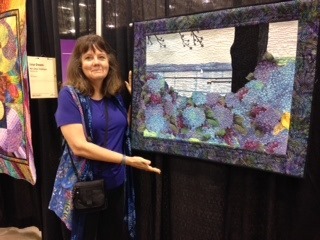 It wasn’t a prize winner, but I was happy to just have it show with all those talented quilters’ creations! I was certainly a happy camper!